The idea that sadness somehow kindles creativity is a popular and long-lasting one. Its roots go back to antiquity; even Aristotle noted that those who excelled in the arts, politics and philosophy had a tendency toward “melancholia.” The artistic canon appears to be full of people whose dark mental states kindled their brilliance but also brought their lives to an early end — such as Vincent van Gogh, Anne Sexton, Mark Rothko, Ernest Hemingway and Virginia Woolf. This notion is widespread, but in science it remains controversial. Past studies have suggested that negative feelings can provide fodder for art and trigger more self-reflective thought . Others have shown that influential figures in science and art have a tendency toward depression. But research has not really demonstrated a direct link between sadness and many of the most lasting achievements in art history. Now, a fascinating new study from an economist at the University of Southern Denmark appears to show that link. The researcher, Karol Jan Borowiecki, examined the emotional state of three of the West’s most influential composers through the full course of their lives. Using linguistic analysis software that scanned the text for positive and negative emotions, such as joy, love, grief and hurt, he analyzed 1,400 letters written by Amadeus Mozart, Ludwig van Beethoven and Franz Liszt to their friends, colleagues and loved ones. He then compared that data with the compositions they produced in a given time period, looking in particular at their most influential and transformative works. What he found appears to bear out popular ideas about creativity and melancholy: a link between periods of negative emotions, especially sadness, and artistic brilliance. The three composers that Borowiecki studies lived in roughly the same time period and region of Europe, and all had turbulent lives, sometimes tragic and sometimes jubilant. Mozart was lauded as a child prodigy but was driven to depression when he was forbidden from marrying a girl he loved and his mother suddenly died. After the death of his father, Liszt became his family’s sole breadwinner at a young age; he was never able to marry the woman he loved, and he saw his children pass away before him. For all their extraordinary achievements, Borowiecki’s analysis suggests that the causes of these composers’ happiness and sadness were the same as any ordinary individual. Their letters reflected high emotional states when they had stable and engaging employment, solid personal relationships and good health. Negative emotions appeared when they fell on hard times financially, when their health became poor or especially when a close relative died. Borowiecki’s analysis suggests that negative emotions are not just correlated with creativity but that they actually have a causal effect on it. Using econometrics, he calculates that a 9.3 percent increase in negative emotions leads to a 6.3 percent increase in works created in the following year. 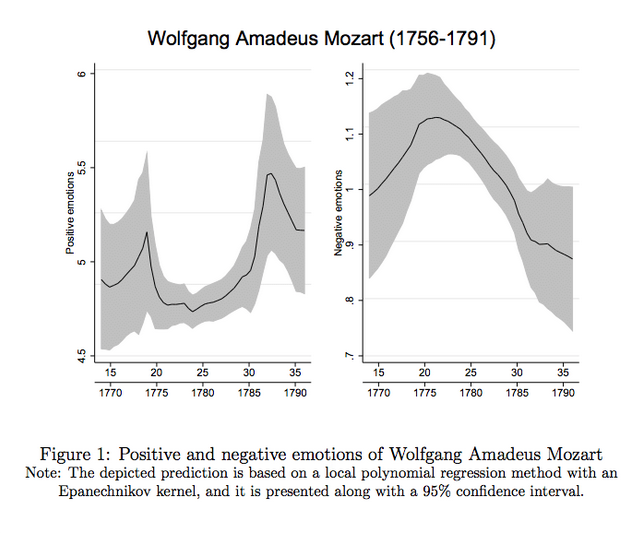 To generate an entire important composition in the next year, the composer would need to see his negative emotions increase by about 37 percent. “Creativity, measured by the number of important compositions, is causally attributable to negative moods, in particular to sadness,” he writes. The analysis turned up a few other interesting findings. For one, composers appeared to write more letters in times of negative emotion — especially when they were angry — and fewer when they were happy. The data also showed that getting a permanent, tenured position and being married or cohabiting were associated with less productivity and less creative output. Of course, this shouldn't be a rationale for anyone who has depression to stop taking their medication. But it appears that the most lasting inspiration for artists may come from the most difficult moments.